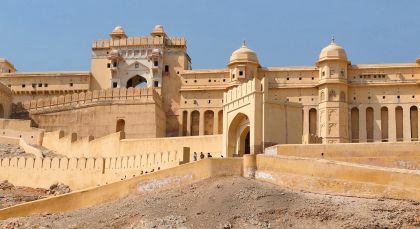 Embark on your tailor-made VIP tour through North India and the Himalayas. Curated by our local experts, your trip will include the best transport, luxurious stays and superior service on every step of the way. 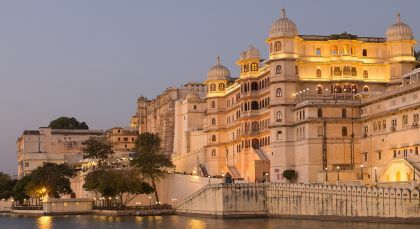 Experience regal India with the comfort and security of a private Enchanting Travels tour. 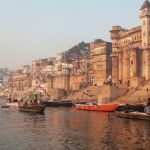 Discover the highlights of Northern India cocooned in the lap of luxury! 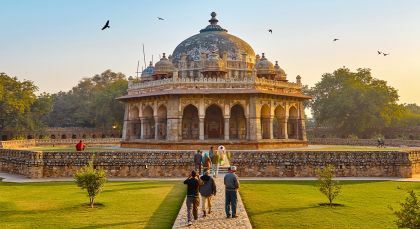 From delightful camping experiences amid the lofty mountains of Ladakh, to the romance of white marble in Agra and palace stays amid the shifting dunes of Rajasthan, this private North India tour offers it all. Set in a little ‘mohalla’ (neighborhood) of Delhi called Dargah Hazrat Nizamuddin (saints’ tomb), enjoy a private Qawwali performance featuring popular devotional songs inspired by a mystical strain of Islam – Sufism, teaching Ishq (love), Aql (intelligence) and Ilm (knowledge). The troupe comprises 8-9 men with a lead singer, side singers, harmoniums, and percussion instruments. The songs embody love, devotion and longing, and are performed with devout passion! Pilgrims come either dressed in yellow clothes/sporting a yellow scarf. Stroll ancient crowded alleys to explore monuments and sites linked to famous Sufi saints – Nizamuddin Aulia, Amir Khusrau and Mirza Ghalib. Put on your dancing shoes and shake a leg Bollywood-style! Don colorful costumes and participate in a special dance workshop designed for dance enthusiasts! The Namaste India Dance Workshop is a two-hour crash course on three different Indian dance styles – Bollywood, Bhangra and Dandiya (folk dance). Your first hour is spent learning the steps of Bollywood dance, while the next two half hours will be dedicated to Bhangra and Dandiya respectively. Afterwards, record your newly learnt skills on a two-minute video produced just for you. The video will be privately uploaded to Youtube so you can share it with select loved ones upon you return. 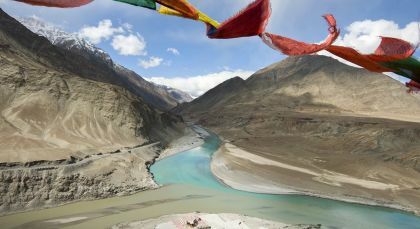 Leh, also dubbed Little Tibet, is a mesmerizing land of contrasts, with its stark and scenic beauty. Embark on a luxurious nomadic journey in breathtaking Ladakh! Stay four days at ​The Chamba Camp in Thiksey to explore the hidden treasures of the lush valley. On your first day, acclimatize​​ to the higher altitude ​as you ​discuss your activity preferences with advice from the in-house ​specialist. Spend the morning of your second day soaking in your beautiful surroundings. Birdwatchers can set out early accompanied by​ a​ trained ​naturalist, and return for lunch at the camp. In the afternoon, travel to famous local sites​, including the 17th century Leh Palace, Munshi House, old bazaar and the spectacular Shanti Stupa​. K​eep up your energy levels with steaming cups of butter tea​! ​On your third day, ​start early for ​a visit to Thiksey ​Monastery​ and participate in the​ sunrise​ Morning Prayer rituals. Breakfast is served back at the campsite, after which you can explore the area on a bicycle or drive to ​the village of ​Saboo​​ to meet the Oracle. Witness the imposing Hemis Monastery – the oldest ​Buddhist institution in Ladakh, in the afternoon. ​On your fourth day, a​waken to the beautiful sights and sounds one last time, before ​leaving t​his delightful Himalayan valley. 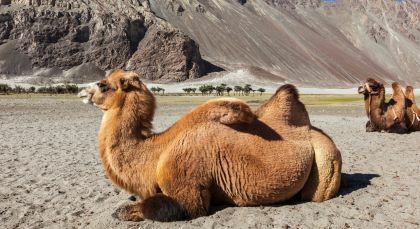 Known for its orchards, scenic vistas, Bactrian camels and monasteries, Nubra Valley lies in the northernmost part of Jammu and Kashmir. Take a magical drive through breathtaking terrain to get to ​The Chamba Camp in Diskit​, the ultimate place to ​embrace luxury camping in the heart of Ladakh​​. Your three day​ tented experience​ includes tours of the incredible region. On the first day, take a trip past the picturesque​ village of​ Hundar to ​witness ​the awe-inspiring ​traditional Buddhist monasteries ​of C​h​amba ​Gompa ​and Dikshit Gompa​​,​​ before returning to camp. Your second day ​takes you to Turtuk – home to the erstwhile ​​Balti ​Dynasty​, a bold Germanic tribe​. Enjoy a picnic lunch near the frontier hamlet before returning to camp. ​Begin your final day with a camel​ ​ride ​through the scenic ​hamlet of ​Sumur ​and explore ​the famous sand dunes ​of the ​region. ​You can also stop en route to visit the stunning 150​ year​ old Samstanling Monastery. After your visit, make your way back ​to Leh. Transfer from Airport to Hotel. Experience the VIP Enchanting Service, which includes a fast track personal airport meet and greet facility for your arrival. 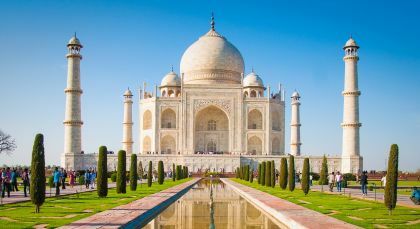 Experience a memory of a lifetime with the mesmerizing beauty of the Taj Mahal – one of the 7 wonders of the World and a World Heritage site – magnified further by the enchanting moonlight….something you cannot afford to miss! The Taj Mahal, it is said, changes its colors during the full moon nights…if you happen to luckily visit during such a night! Accommodation (on a twin-sharing basis) on the indicated meal plan for 18 nights. Enchanting Travels did a superb job of making sure we were taken care of every step of the way. I am deeply appreciative of all the research they have done to ensure a safe, enjoyable experience for their clients.